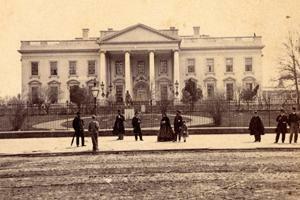 The White House, circa 1860s. Photo provided by the White House Historical Association. What’s the most famous address in the United States? It’s got to be 1600 Pennsylvania Avenue. Every year, tourists the world over descend on Washington to catch a glimpse of the White House. Even during times of fractious politics and concerns about the nation’s future, millions of Americans revere the executive mansion. Despite American University’s proximity to, and intense interest in, US politics and the presidency, it’s never had a course on the White House itself. Until now, that is. This fall, AU is rolling out a class called “A History of the White House.” It's hosted by the History Department in the College of Arts and Sciences, and it includes contributions from the School of Public Affairs. For this undertaking, AU is partnering with the White House Historical Association. Matthew Costello—a senior historian for the association and an AU history adjunct professorial lecturer—will oversee academic requirements for the class. Professors Dan Kerr and M.J. Rymsza-Pawlowska, who co-direct the AU Public History program, worked closely with Costello to develop the course. This grew out of AU’s relationship with the White House Historical Association, a nonpartisan organization that assisted with the Legacies of America’s First Ladies conference series held by SPA. In 2014, the historical association teamed up with AU’s MA in Public History program to establish a public history fellowship for graduate students, and this course is an extension of public history offerings for undergraduates. The White House Historical Association employs quite a few AU alums, including: Jessica Fredericks, communications director, SOC ‘11; Evan Phifer, research historian, CAS ‘15; Lucy Crowley, director of marketing, CAS ‘10 and ‘17; Joanna Capps, director of education, CAS ‘15; and Amy Weiss, communications consultant, SOC ‘87. The class will cover the White House as a national landmark and living museum, its architectural transformations, the history of its occupants and staff, as well as the presidency itself. They’ll delve into various themes and feature guest speakers. McBride, former chief of staff to Laura Bush, will participate in several sessions and will be responsible for the section on first ladies. McBride notes the presidents who have appeared at AU, from Dwight Eisenhower to John F. Kennedy to Barack Obama. “AU has had a long history with presidents and first ladies already. So it really made sense that AU is the institution where the White House Historical Association launches this unique course,” she says. George Washington was the only president who didn’t live in the White House, but he had influence over its design and location. McBride says there’s a marker inside the building that identifies four key years in the White House’s evolution: 1792, the laying of the cornerstone; 1814, when reconstruction was needed after it was set ablaze in the War of 1812; 1902, when renovations were planned to separate living and working spaces in the West Wing; and 1952, when the Truman administration renovations were completed. Yet it was Jacqueline Kennedy’s vision in 1961 that elevated the modern White House. “She did this major restoration, because she had been so dismayed when she walked in as an incoming first lady. She felt it was very disappointing that the house did not convey the history as it should,” says McBride, noting that the Truman renovations included department store furniture. Kennedy gathered input from the greatest minds in architecture, art, design, and history, and with private funding, they acquired a new collection. She also saved a Lafayette Square block of historic homes from a demolition plan to install office buildings. McBride marvels at how Kennedy, then in her early 30s, had such foresight at a young age. “It was just this incredible sense of history and preservation, and what all these buildings would mean for teaching the story of our country,” she explains. The White House benefited from the ingenuity of many first ladies, McBride says. Dolley Madison invited key players from all sides of the aisle to her receptions. Edith Roosevelt helped guide the West Wing project. Laura Bush, among other initiatives, oversaw the refurbishment of the Lincoln Bedroom to evoke 19th century authenticity. Eleanor Roosevelt, in what now seems like a prescient move, held all-female reporter press briefings. Michelle Obama’s showstopping speech at the 2016 Democratic National Convention held up a mirror for the nation. “I wake up every morning in a house that was built by slaves. And I watch my daughters, two beautiful, intelligent, black young women playing with their dogs on the White House lawn,” the first lady said. The AU course will examine the White House’s connection to slavery and the worst chapters of American history. The nearby Decatur House formerly had slave quarters. Now it has a teaching room that explores this issue, which will be incorporated into the AU class as well. There’s extensive documentation about White House staff, and Adrian Miller’s book, The President’s Kitchen Cabinet: The Story of the African Americans Who Have Fed Our First Families, From the Washingtons to the Obamas, is a required course reading. McBride thinks part of the White House’s allure is its accessibility. “From the very first days of our founding, the White House was open as a public place,” she says. For many years, she adds, New Year’s Day was a special holiday where people could come shake the president’s hand. “I think that there is this growing sense that the more the American people can feel connected to the White House, hopefully, the more that they’ll understand about the importance of the building,” she says. For AU students, this class is a great place to start.